Note: Australian players are no longer accepted at 21 Prive. The information provided in this article is intended for international readers only. Established in 2014 by the same people who brought us G’day Casino, 21Prive.com provides an excellent space for online players to enjoy a range of real money blackjack games from leading game developers like NetEnt, BetSoft, NYX Gaming and more. 21 Prive also offers an impressive live dealer game catalogue, along with an easy to navigate mobile casino. There is no shortage of special offers, with a different bonus available each day of the week. You’ll continue to be rewarded at 21 Prive, with a 10% matched deposit bonus up to $50 available on every deposit you make at this site, even after the welcome bonus has been exhausted. Keep an eye on the promotions page to stay in the loop of ongoing bonus offers. 21 Prive has weekly casino promotions that include the Monday Blues Buster, Mystery Bonus Must Have Tuesday, Break the Bank Wednesdays, Tremendous Thursday and Weekend Cash Matches. Note: wagering requirements apply to all matched deposit bonuses; check the terms and conditions of these offers on-site for full details. Like most leading casinos these days, 21Prive.com provides its games in instant-play mode, which means that you don’t need to download any specific software to play here. Games are accessed directly over your web browser and depending on your Internet speed, games can be played within seconds of making your selection. The beauty of browser based play means that you’ll have full availability to these games whether you’re using a PC, laptop, Mac, smartphone or tablet. 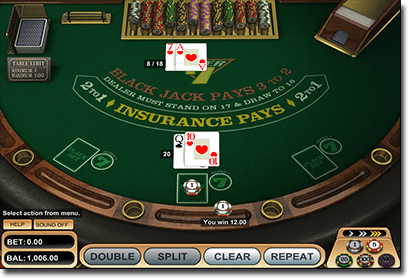 21Prive.com has a solid selection of blackjack variants from leading game developers NetEnt, BetSoft and NYX Gaming to choose from, and given the browser-based nature of this site, you can try as many games as you like without having to waste any extra time on downloads. These games of 21 can also be played for free in demo mode if you want to get a hang of the rules or gameplay format before committing to a real money bet. To locate these games simply click on the ‘blackjack’ tab under the Game Category listing down the left hand side of the casino lobby. If you want to try something different between blackjack hands at 21 Prive, there’s a giant selection of other casino games to choose from. For those who enjoy a quick spin on the slots, there are literally hundreds of online pokies available, including popular titles like Gonzo’s Quest, Spinata Grande, Mega Fortune, Hall of Gods, Starburst, Twin Spin, Aliens and South Park Reel Chaos. You can also try your luck on mini-games like online scratchies, keno and bingo. If table games are more your thing, there’s a great selection of sophisticated roulette, poker, baccarat and video poker games to choose from. Amongst a collection of 10 premium live dealer games at 21 Prive Casino you’ll find three suave live dealer blackjack games – Live Blackjack and Live Common Draw Blackjack from Ezugi, and Live Blackjack from NetEnt. Each of these games is hosted by friendly, attractive croupiers from high-end casino studios that genuinely replicate the feeling of playing in a world class venue. These live dealer titles offer fully-customisable audio and display options, and Ezugi’s live blackjack has a chat option as well as a social media plug-in that allows you to invite friends to the room via Facebook. Live dealer games require real money bets in order to play and can’t be accessed for free in practice mode. 21Prive.com also offers live roulette, live baccarat, live keno and live lotto. If you’re reading this on your smartphone or tablet, tap our links to head direct to the 21Prive mobile casino and take advantage of the 100% matched deposit bonus along the way. Payments are accepted using various currencies, just make sure to select your local currency when registering for an account. These deposit methods provide instant processing, so you can start playing real money games at 21 Prive right away. You can check the daily, weekly and monthly transaction limits that apply to each payment method in the cashier section when logged in to your account. Players are rewarded for their time at this site thanks to the 21Prive Rewards program. Upon making your first deposit at 21 Prive, you’ll be rewarded with 500 points to get you started and from there you’ll accumulate more loyalty points the more you play. For every $10 you wager, you’ll be eligible for up to two loyalty points, but be mindful that playing blackjack will only contribute to 0.50 points. Your points can be redeemed for bonus money along with other exclusive offers, with bigger bonuses available the higher you rank on the loyalty ladder. 21 Prive is protected by the strongest available digital SSL (Secure Socket Layer) encryption, courtesy of RapidSSL. This makes it near impossible for another user or third party to intercept your personal details, leaving you to deposit money without any concerns to your online safety. A dedicated help desk is available 24/7 to assist with any queries you may have, be it regarding security, deposit options, special promos, game rules or any other question that needs answering.